Onça teaches group and individual bellydance, stagecraft, and business coaching for artists, through lessons in her home studio, throughout Virginia, and across the country. 8-9pm. Beginner Bellydance and Choreo Fun. SOUL Aerials and Performing Arts. Call (804) 310-4858 or visit http://www.soulaerial.com/ to register. 6:15-7:30 World Spirit Troupe Rehearsal. World Spirit Bellydance Clubhouse, private studio, Richmond. Pay dues here. 7:30-8:45 All Levels Polish Intermediate Class. World Spirit Bellydance Clubhouse, private studio, Richmond. Register here. 7:30-8:45 Foundations of Bellydance. World Spirit Bellydance Clubhouse, private studio, Richmond. Register here. Madame Onça brings the art of the sword to Prague in the Czech Republic. Work one on one or in small groups to deepen and polish your work, be it in dance, theatricality, or carving a career for yourself in the arts. Take it to the next level with an international instructor. $50 an hour. Contact lamadameonca@gmail.com to schedule. Onça hosts and teaches Bellydance workshops year-round throughout the US and beyond. She has been a featured instructor at TribalCon, TribalFest, Tribal Revolution, Elevation, Las Vegas Bellyance Intensive, Tribal MiniMassive, Art of the Belly, East Coast Classic Competition, Cairo Caravan, and many other events. She has also taught through many colleges and universities. See Schedule (link) for more information. Bellydance & stagecraft instruction, USA. 1999-present. Onça has worked with thousands of people in the US as well as abroad, teaching bellydance and stagecraft in a broad variety of settings. She has a featured instructor at festivals across the States, including TribalCon, TribalFest, Elevation Festival, Art of the Belly Fest, Tribal Revolution, East Coast Classic Competition, Las Vegas Bellydance Festival, Red Clay Raqs, Belly Horror Fest, and others. 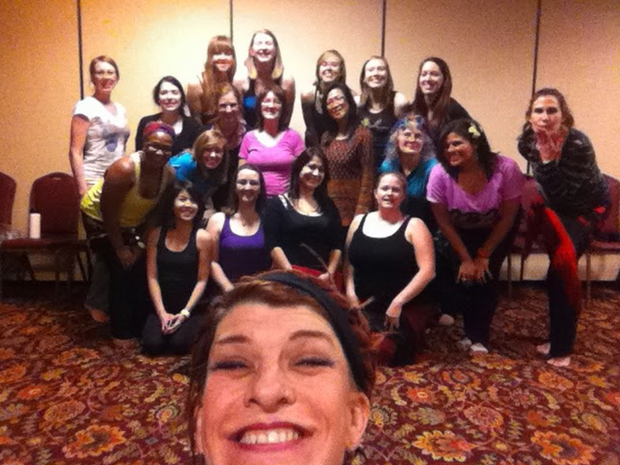 Happy workshoppers at the 2014 East Coast Classic, photo credit selfie. Places of instruction include but are not limited to Clemson University, Western Carolina University, Warren Wilson College, and Wake Forest University. She has also taught and performed for students of all ages in environments diverse as the Marion County (NC) Arts Association, Claxton School for the Humanities, and Transylvania County Middle and High Schools. She travels internationally to teach and perform, and has been a featured instructor in Czech Republic, Germany, and Scotland, in international waters through the Belly Cruise, and also throughout the United States on the professional circuit. Onça directed and taught bellydance classes at the Future of Tradition Center for Folkloric Arts, a cornerstone presence in the developing River Arts District of Asheville, for seven years before opening the more intimate Asheville World Spirit Studio. Co-founded, directed, and taight bellydance at the 3500 square foot folk-art center which served as a hub for world performance traditions, as well as a birthing ground for the regional Neo-Vaudeville movement. FoT offered affordable Fine Art studios, movement and performance space. Baraka Mundi offered ‘Performance in the Park’, interactive music, performance and instruction in public spaces, through a grant from Arts2People.